Beeston is a district of Nottingham which lies about three miles west of the city centre on the A52. My memories of the place are rather faded, for I was last there about twenty years ago when I spent two weeks on a training course. Even so, I do not recall it as an area likely to support the sort of carol tradition you'd encounter in villages of West Yorkshire or parts of Derbyshire. Unfortunately, this CD bears out my supposition. My second reservation is less concerned with aesthetics than with what does and does not constitute a vernacular singing tradition. Before I go any further, it is worth stressing that Yorkshire and Nottingham traditions have a common basis in that they are both seasonal observance rituals. 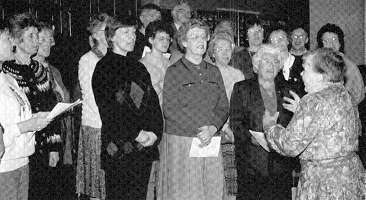 Moreover, although Yorkshire singers nowadays celebrate Christmas in the pub they were formerly peripatetic, just as Beeston are today. Even so there are significant differences in function. The village carollers were house visitors. Beeston nowadays collect at specified sites for charity, rather like the Salvation Army. My contention, however, is that the differences in performance stem not so much from differences of function as from differences in social organisation. In a nutshell, the rural carolling collectives are built around local communities and they stress communal ties. Beeston, on the other hand, is built around a formally constituted organisation. Not all communities are rural of course. Before slum clearance, the rows of back-to-back housing, which pervaded every town and city in Britain, held communities just as intense as those of their rural cousins. They were built around kinship and employment networks and the social fabrics of pub and church. An Irish social worker of my former acquaintance once described the solidarity of a part of Birmingham where he had worked. "Hit one of them", he said, "and you hit the whole fecking street". Back street communities are now largely in the past. It may be that groups of immigrant families band together out of sheer isolation. Otherwise, urban society has become not so much face to face as faceless. We still interact with each other, but generally on an isolated basis. The people we choose as drinking companions are seldom the people we work with. We generally know our immediate neighbours, but seldom would we call them friends. Those of us who sing in public do not often meet our singing companions in any other context. Lack of intimacy makes for lack of solidarity and lack of solidarity is underpinned by changing conditions of life. In a world of comparative affluence, and one in which the welfare state still has not been completely demolished, there is no longer any need for people to cling to each other. If we do not cling to each other for reasons of security, we will not cling to each other in song. In presumed mitigation of this, Ian Russell points out that the Beeston carollers possess an unbroken tradition going back at least one hundred and thirty years. That would put it back to around the time when many of these carols were being discarded by the orthodox church. That makes me wonder whether a link may exist between the survival of these carols and the non-conformity which was strong in the area at that time. Until fairly recently, non-conformists constituted a disadvantaged minority. Isolated and discriminated against, they were tailor made for the retention of communal forms, and for the retention of those carols which had been abandoned by orthodox religion. I am not, of course, attempting to generalise an explanation out of the Beeston experience for the survival of carolling generally. However, I would offer the following as a hypothesis. Where the survival of the carolling tradition in West Yorkshire and Derbyshire may be attributable to geographic isolation and attendant retention of communal ties, social isolation may have wrought a similar effect in Beeston. Community and isolation could therefore have played a significant part in shaping the original Beeston tradition. If so these factors scarcely apply nowadays, but we can nonetheless see a similarity between the early social organisation of this urban tradition and the later organisation of rural ones. I can however find no justification for Ian Russell's claim, that the oral nature of Beeston carols puts them on a similar footing to those further north. True, Beeston carols were until recently passed on by word of mouth, although that is no longer the case. True, also, that is how village carols are usually transmitted, although they too nowadays are frequently sung from a book. But most of the world's music, from Ravi Shankar to the Beatles, is orally transmitted. The idea that melodies and texts are fixed entities, to be performed according to the dictates of the printed page, is something which emerged with the Western European classical tradition. Classical singers rely on print, so do light opera companies, so do church choirs. For most other people, printed music represents little more than a handy means of storage and retrieval. So what can we say in mitigation of this production? It is as handsome as anything else in the Village Carols series and the subject matter has been researched with Ian Russell's usual thoroughness. I can certainly recommend the accompanying booklet. As well as a first class introductory essay there is a full set of texts and tunes for the non-standard carols, and there are news clippings and photographs of the choristers. Beeston Methodist Church Choir will, I am sure be proud of this production, as will the congregation. For that matter, there has been a significant growth of interest in west gallery singing in the last few years. Various protagonists will find this a noteworthy extension of their tradition.